The Canadian Intellectual Property Office offers short videoclips for students interested in learning more about intellectual property. 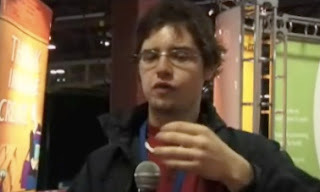 The videos feature Canada's promising young scientists tackling tough questions in mini-interviews held during the Canada-Wide Science Fair 2006 in Saguenay. Students who watch these video clips will found out how the science fair projects came about, how the exhibitors became interested, the process for doing the project, the scientific approach, the importance of a logbook, the most difficult step, the involvement of a mentor as well as their opinion on intellectual property. Parts of the videos are in English and parts of them are in French. All videos are in Windows Movie Player format. November 1, 2011 at 11:10 p.m.